We have an internal all-hands weekly email here at Distilled summarising what each department has been up to. It was while writing up a bit about what had happened on a marketing / networking front that I realised the variety of things I've been involved with recently. I thought I'd do a quick write up. It's a little light on technical advice - more a catch-up and a sorry for not writing more recently (keep your eyes open for some fun stuff coming soon). Skip to the end for the celebrity spotting! NESTA - the National Endowment for Science, Technology and the Arts - is running a mentoring scheme for creative businesses. They selected us to be one of the companies mentored under the scheme. We are working with John Varney (who used to be CTO at the BBC). John is now an investor and advisor to a number of start-up and early stage technology companies - many in the valley. We are working with him mainly on strategy (so far - I'm sure he'll be getting involved with some details too!). The program is running as a pilot - an attempt by NESTA to understand how mentoring schemes should be run and to experiment with a variety of techniques. Although this means that there is a fair degree of form-filling and administration to the whole thing, the introspection does seem to be useful. In particular, I attended a full-day event recently with all the mentors and mentees which served a joint purpose of giving a lot of feedback to NESTA and being pretty valuable to us mentees. Not only did I get to learn some things about how others are getting value from their mentors, but also got to meet some mentees running some exciting small businesses as well as some experienced mentors. I particularly enjoyed a session at the end of the day where we discussed a number of general questions in small groups rotating around the room to meet a range of mentors. I got some good bits of advice from some pretty high-powered people. I hope that the program offers more opportunities to mingle in this way. In the meantime, however, we are focussing on getting value from John (in the nicest possible way!). He has already been pretty influential in getting Duncan and I to separate the strategy and management elements of our roles and now that we have spent some time together working on medium-term strategy, we feel pretty excited about what we are going to get to work on next. (That strategy is being talked about internally at a company meeting next week, by the way - some bits will no doubt take a while to become public, but we'll talk about them as soon as we can). Anyway, through my involvement with the network (which seeks to connect the 'ones to watch' in networking situations after all the PR hubbub has died down) - including hosting a networking breakfast - I have been named one of 10 'ambassadors'. I'm not 100% sure what this is going to involve, but I have already been doing some judging for the next network announcement and early next week we're being jetted off to see Courvoisier in Jarnac, France. I'm still not quite sure if that counts as a work trip or not. The cool thing about being an ambassador from Distilled's point of view (beyond me getting trips places) is that we get the guys at Focus putting some thought into getting us all some coverage and also Courvoisier providing some pretty awesome drinks at all kinds of events. Last Friday Mel Carson (twitter) kindly invited me to join him at #badabing (that was the twitter hashtag for the day). It was great to be there with clients and prospects as well as a bunch of industry friends - Dave Naylor, Dixon Jones, Andrew Girdwood and others. 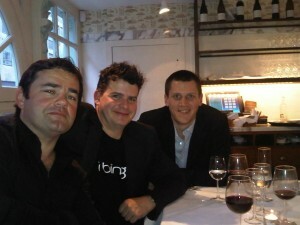 We had a lot of fun learning about some of the cool stuff that bing can do (in the US! - even though I understand the reasons, I am frustrated that bing being in 'beta' in the UK means that it is essentially a rebranded live search at the moment and we have to wait until late 2009 / early 2010 for the US-style features). I think there are a few things that could shake up elements like keyphrase research if it gets a decent market share - with the segmented search making it natural for searchers to refine their searchers in well-defined ways. By making these refinements feel more like a navigation menu than typical filter links, I think they will encourage widespread use. Then I guess it is mainly about getting people to try it - but that's what the huge marketing budget's for, right? The biggest surprise though came in the form of Mel's new twitter buddy, Will Carling who came along to do the after dinner speech. I was lucky enough to be seated 'on high' next to Mel and we enjoyed hearing stories all evening about the Welsh on tour from Will. We also met the tech guy, Dave Tosh who is behind Will's rugby social networking site rucku. As DaveN wrote, it was good to hear about the celebrity benefits of twitter whereby guys like Will Carling can speak directly to the public without a publicist in the way.